Identify different types of triangles, quadrilaterals, and other two-dimensional figures in this interactive math test. Determine some of the characteristics of these polygons. This test has seven multiple choice questions and three drag-and-drop activities. The student must know the difference between an isosceles triangle and a scalene triangle. 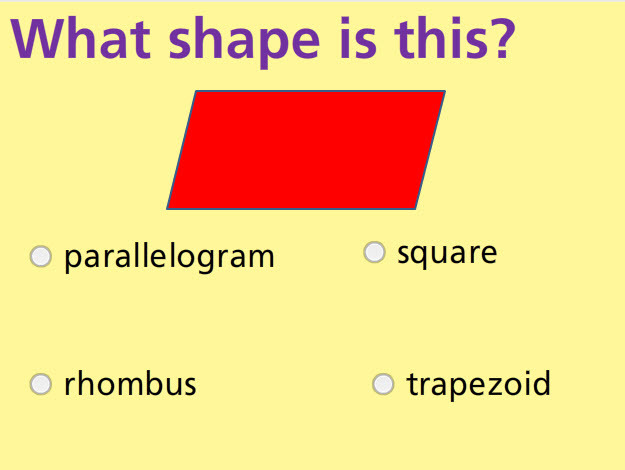 The must know what a trapezoid looks like. Also, they must be able to identify a decagon, pentagon, heptagon, and many other kinds of two-dimensional figures. Return from this Classify Two-Dimensional Figures Math Test to the Elementary Math Tests, 5th Grade Math Tests webpage, or to Math Tests.